Winterfest is Right Around the Corner! Winterfest is almost here! Next Friday, Dec. 21 will be our NEW math and science festival. Math and science students at various grade levels will be facilitating activities directly related to the concepts they are studying. We are excited to launch our re-imagined concept of this day after a one-year hiatus to re-frame how we celebrate the exploration and study of math and science at The Northwest School. Returning students can expect different kinds of presentations than in past years, but smaller, more engaging activities that show how dynamic and intriguing science can be. There will be no classes for any grade level and students do not need to bring backpacks. All students should attend ready to be full participants on the final day before Winter Break. This is a required school day, and the regular school absence policy applies. The day will end no later than 2:30 pm. Contact Cecilia Tung with any questions about Winterfest. There will be after school care available for Middle School students starting at 2:30 pm. On Monday Dec. 10, emails were sent out to parents regarding book purchases for Trimesters 2 and 3. Here is a link to our online bookstore. Please note: if no classes are listed for your student, no books are required for purchase. Our first Middle School dance will be on Thursday, Dec. 20, 6:30-8:00 pm. There will be an optional potluck dinner from 6:00-6:30 pm. If you would like to participate in the potluck, please remember that we have a nut-free policy for the safety of our students. Students will not be turned away from the potluck if they cannot bring food. No additional food will be provided for the dance. The dance will officially begin at 6:30 pm. During the dance, there will also be a variety of games available, and students are invited to bring their own games. This is a cell-phone-free event and is for students only. Please pick up your student at the main entrance of the school on Summit Ave. If your student will be walking home or taking public transportation, please communicate your permission for them to do so in an email to Maria Moses. You can check out our website for the latest news around the school, such as how the entire 8th grade class is working on a new interdisciplinary curriculum in their Humanities and Spanish classes. Don't forget to follow The Northwest School on Instagram for a daily visual dose of life in the house! We would like to invite your students to join our Middle School Winter Basketball Clinics! The clinics will be led by Northwest Upper School basketball players and coaches. The clinics will focus on developing individual fundamentals in a team-oriented, encouraging, and fun environment. Students will participate in skill-building drills, individual competitions, and scrimmages. Participants will also receive a camp t-shirt. Suggested fee is $40 (but is not required; please pay what you are able). This event is open to any students grades 5-8, including both Northwest and non-Northwest students, so please feel free to spread the word! Contact Britt Atack with any questions. The Outdoor Program will be busy in the winter with some great trips lined up after the break. Students have the opportunity for snow camping at Mt. 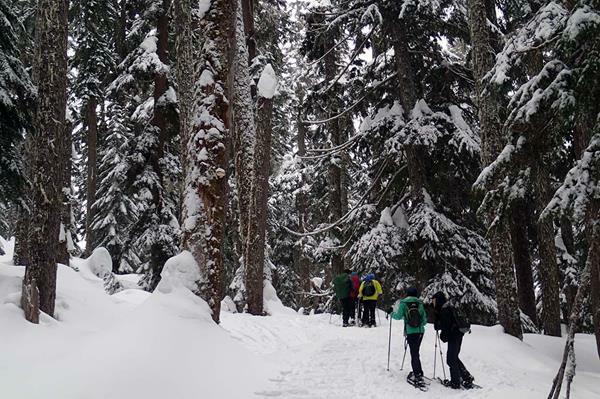 Baker, cross country skiing at Snoqualmie Pass, snowshoeing in the Cascades, and cycling around the San Juans. More information for the trips can be found on the Outdoor Program webpage. In addition to these trips, Northwest will also run a ski bus for night skiing at The Summit at Snoqualmie Pass on Jan. 11, Jan. 25, Feb. 1, Feb. 8, and March 1. Contact Sarah Eklund with any questions about the ski bus. On Friday, Jan. 8, The Northwest School will celebrate Martin Luther King Jr. Day from 8:00 am-12:00 pm. There is a scheduled early dismissal for the day, so we have organized an optional community service event with Seattle Parks and Recreation from 12:00-3:30 pm for Middle School students. If your students is interested in participating, please use this link to sign up for the event by Dec. 31. This event will happen rain or shine, so please dress for the possibility of rain. The Opera Club will be attending a dress rehearsal of Il Trovatore on Jan. 10, at 7:00 pm, at McCaw Hall. Tickets are $15 per person and parents are welcome as chaperones (The Northwest Experience Fund will cover students on financial aid). Sign up on the sheet outside the Humanities office or contact Adina Meyer. Please note: This opera contains mature themes. The Northwest School will be hosting four exchange students from our partner school in Taiwan, Affiliated High School of National Chengchi University (AHSNCCU), and are looking for a homestay family from our community to host one of the male students. Taiwanese students will come to Seattle on Jan. 18 and stay until Feb. 9. While at Northwest, students will audit classes and participate in various social activities at school. If you are interested in this exciting opportunity or have any questions, please contact Director of Global Programs and Outreach Dmitry Sherbakov. Did you know that Amazon will give to Northwest every time you make an eligible purchase on Amazon.com? To set up your support, go to smile.amazon.com, search for “Northwest School of the Arts, Humanities, and Environment," and select us as your charity of choice. Donations are only applied if you begin your shopping at smile.amazon.com. Click here to learn more about AmazonSmile. If you have any questions, please contact the Development Office.